Fire Soul left the Dark Wolf Pack to start a new pack, a new life with her male wolf, Night Glow. 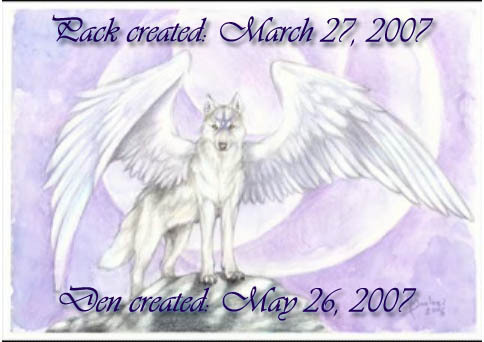 The Lunar Cycle Wolves… Though things were happy at first, the relationship between them became difficult and after 10 months of courtship the pack broke a part. The once proud Alphess stepped down as Beta. Her once great mate had told lies and deceived her… So Fire Soul in all her power, left the pack... beside her was Knight a black wolf with eyes like Egypt, and Snow Storm the white wolf of energy. Fire Soul leaving her mate, and filled with regret for the things she had done, did her best to lead the remainder of the pack. But in the end, they were more like friends, than a pack of power. Praying for help, looking for a sign, the wolf Fire Soul fell a sleep late one night, and a White Wolf, came to her. In dream, she was stripped of all her color, and the White Wolf called her Shy-uh-Day… which in the wolfen tongue means Day Shy. "One who is shy by day and wild with song by night". When Fire Soul awoken, her once fiery reds, flames of color on her coat were gone. White fur replaced all her color… Was it just a dream? She looked to her two wolf companions who did not share the same knowledge as she of the White Wolf… She looked to her beta ranked wolf, Snow Storm, and they talked of a new pack… Her slight mutral attraction to the both of them made her quiet fond of her wolfen male friends, carrying on with a broken heart. Fire Soul didn’t hold close to either of them, or let either of them know of her feelings, in fear of the same heart break that had got her just weeks before… She stood strong against the troubles that came to the new pack … They had an Alphess, a Beta, and Pack Member. Now all they needed was a name. Thus, the Zodiac Wolves were born! And with it, she led with her new name, Shyo’Day. There in the warmth of a damp wood land… a forest like home was made. The tall trees towering over the damp soft earth, covered with the sweet greens of a thousand colors. Flowers and grasses, some tall to their shoulder, others low to the ground, soft around there feet. A strong flowing river that makes its way to the large body of water, with the little streams running off it of many directions. The clears skies, and the calming breeze, and sweet smell of the natural place around them… They had stumbled upon a paradise all their own. Shy looked around at this beauty of green meadows and moist forestry. She looked, and she was happy… Though in this time, Knight moved on. He no longer felt the need or the want to carry on in this great place. He left the pack to find another and start a pack all his own. In this place though, other wolves searching for a pack, searching for a place of safety and acceptance, found these green lands, and stumbled upon the Zodiac Wolves. They joined, and the pack became strong once more… Then one day, walking threw the forest, Shy was found by a large black dragon! Smooth scales, long white horns, and the lightest shade of blue eyes Shy has ever seen. A little nervous of this dragon, Shy and him talked. His name was Enismirdal. They talked and talked, and got to know each other fairly well. Shy returned to her pack, and each day would go and find the dragon, Enismirdal. Time went by and she became quiet fond of him. Shy asked him to be her Alpha male in leading the pack. Though, knowing that a Dragon and a Wolf could never truly be, she loved him. In a short time, after these to friends talked and a new Alpha male (a man, trusted friend, Levi) was chosen to lead. Snow Storm left the pack, leaving Shy heart broken and sad… She stayed good friends with the Dragon, they're good friends still. For a long time the pack moved smoothly with Her leading… the alpha male gone more often than home.